With Massachusetts poised to be the 18th state to legalize medicinal marijuana, the politics of pot are set to reach a new high. 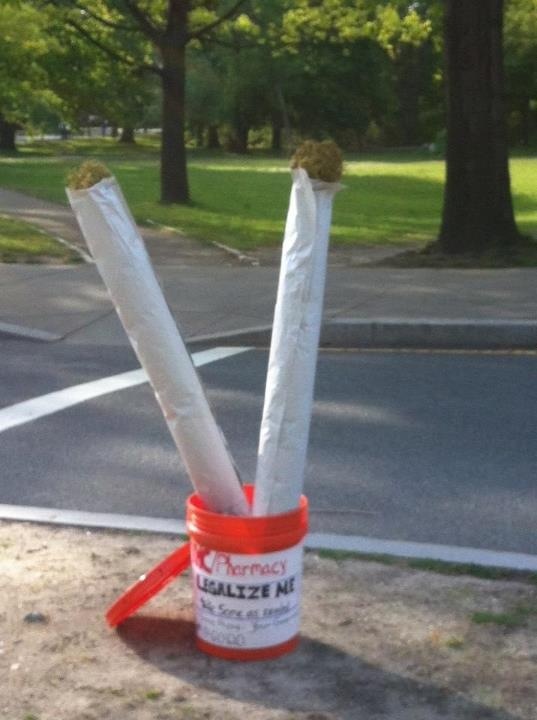 Guerrilla pot protest spotted along the Fenway, Boston. Spring 2012. According to Ballotpedia, the Massachusetts Medical Marijuana Initiative, aka Question 3, will appear on the November 6th ballot to legalize the use of medical marijuana in the Bay State. The law, if passed, would allow up to 35 nonprofit dispensaries (so no tax revenues, a downside) in the first year, with more to follow depending on demand. Let’s say the measure passes, which it probably will. Then what? If we do overturn the prohibition on pot, is medical marijuana the right, first step? Will thousands of suddenly legal “sufferers” come out of the weed woods and into potted paradise? And if marijuana becomes the bridge over that great divide between “bad” and “good” drugs, how do we explain using it to our kids—especially when heavy use in teens can lower their IQ by as much as 6 points? The Boston Globe came out against Question 3, saying that the initiative has good intentions but leaves too much up to chance. Since the FDA doesn’t regulate marijuana, we can’t know enough about the drug to insure its safe use, it argues. The Globe points out that the state shouldn’t try to dispense and regulate a drug without federal testing of its medicinal benefits or its safety, but since marijuana is illegal on the federal level, the FDA won’t test it or issue dispensing guidelines, leaving Americans stuck in a Catch-22. This conundrum also brings us into the issue of states’ rights, namely: how will our local, state, and federal governments interact when it comes to legal medical or recreational marijuana? Will the feds—and our elected Congressmen and women—override state laws that the majority of Americans want? Tom Ashbrook’s OnPoint ran an interesting show on WBUR yesterday about marijuana legalization efforts across the country. On November 6th, Massachusetts, Arkansas and Missouri will vote on legalizing medicinal marijuana, while voters in Colorado, Washington, and Oregon will decide if their states should enact recreational marijuana laws, some of which would be more lenient than those in the Netherlands. Like Prohibition of the 1920s, criminalizing marijuana is a waste of time, effort, and lives. Our courts are backlogged, our prisons populated with people guilty of smoking a joint. Pot prisoners — some 800,000 of them a year — aren’t violent offenders, yet they cost taxpayers a billion dollars a year to process and incarcerate. I contacted Allen St. Pierre, the executive director of NORML (National Organization for the Reform of Marijuana Laws), who told me via email that three-quarters of Americans support medical cannabis, and almost the same amount (73%) support decriminalization. Half of Americans surveyed believe that cannabis should be legally controlled like alcohol and tobacco. St. Pierre also said that NORML, along with New York Times’ pollster Nate Silver, predict that by 2021 more than 60 percent of Americans will want marijuana to become legal, up from 50 percent today. Sanity is slowly prevailing. Legalization of cannabis in most of America is a fait accompli…while some states will take decades to catch up (i.e., Kansas and other states kept alcohol illegal into the 1950s, long after most states and federal government embraced an end to alcohol prohibition laws). Still, not everyone you’d think would be cool with pot becoming totally legal (for both medicinal and recreational users) is down with it. Some medicinal marijuana growers want to expand and industrialize their operations, and don’t want anyone, including home-growers and recreational sellers, to get a piece of their profits. St. Pierre pointed me to an article by Dominic Holden, Pot Activists vs. Pot Activists, published last March in Seattle’s The Stranger that explains the pro- and con-Initiative-502 efforts underway in Washington state. Take marijuana off the street and into the pharmacies (and coffee bars), and let it be regulated and taxed. While it’s hard to pinpoint the exact numbers, some 5,000 metric tons of marijuana are sold every year in the US, totaling about $15-$20 billion in sales. Let’s banish pot from the black market and move it to the supermarket (Betty Crocker pot brownie mix, anyone? ), because legalizing marijuana makes sense. It is not a gateway drug, but a plant that, unlike taxed and regulated tobacco, has medicinal and other benefits. And while it’s not harmless, marijuana is not addictive or as violence-inducing as alcohol or other street drugs, nor can you overdose on it. As a teenager in the 1980s, my grandparents shocked me when we discussed their belief that all drugs should be legal. But they had lived through Prohibition, and saw firsthand the futility of the 18th Amendment and the crime it spawned. Let’s be realistic: marijuana will always be out there. The laws as they stand now do not work. The war on drugs isn’t working either. Stop the hypocrisy. It’s okay to drink yourself to death at your local bar’s happy hour, but not to spark up a joint on a Saturday night? Get real! Massachusetts decriminalized marijuana possession of less than an ounce in 2008; Question 3 looks like the logical next step in overturning the pot prohibition in our intelligent, progressive state. It’s time to change the dysfunctional status quo, and aim for a new normal. 60 Minutes did a great segment on Colorado’s medical marijuana experience and how it has been a boon to the economy. It has created jobs, filled once vacant warehouses and storefronts with industrial marijuana green houses and dispenseries. The spot also focused on the Catch 22 between Colorado state law permitting the sale and the Federal law prohibiting it. The consensus opinion of legal eagles in the area was that so long as the doctors prescribing the pot and growers growing the pot, the outlets dispensing it and the patients using it were all acting within state law, then the Fed would be inclined to turn a blind eye. Still, not an official position and all it would take is one crusading Federal Prosecutor to stir the ‘pot’ and we would be in store for yet another great constitutional debate over states rights. Stay tuned in I guess. I need to check that 60 Minutes segment out, thanks for mentioning it. I think it would be really interesting if progressive marijuana policies were the deciding issue that brought states’ rights (usually a conservative thing, right?) to the forefront of a Federal judicial policy shift. Talk about groundbreaking. I did a quick web search to find more info about how the repeal of Prohibition worked on a logistical level in the ’30s, to see if there was some precedent, but I didn’t come up with much, and I didn’t want the post to be too long, so I left it out. So many unanswered questions, so much complexity, so little time to sort it all out! But, sort it out we must, because the system we have isn’t working. Interesting times we’re living in! link is here and embedded in the post above.